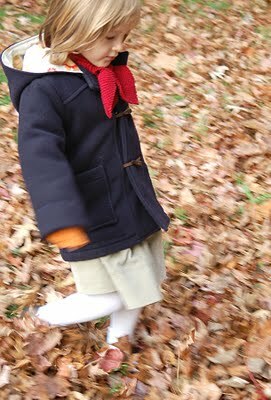 A few weeks ago on my personal blog, I posted about going fabric shopping for S’s new winter coat? Well, while at Mood I fell in love with this amazing navy blue wool-cashmere blend. It was $40 a yard, but trust me when I tell you that if you felt it you would understand. Really. It’s incredibly thick and soft and totally worth the price. (And $40 is actually really cheap for quality coating, I think, despite how it may sound if you’re not accustomed to shopping for coat fabrics.) I briefly considered wrapping myself up inside it right there on the third floor of the store, but that would have been weird. So I took it home and got busy, sewing just a few seams a day. I was almost finished with the outside (why do these projects seem to go so much faster when I’m not writing sewing instructions simultaneously?) when it occurred to me to insulate it! I was inspired by this coat in our Flickr group, so I started searching around to find the right interlining when I came across Thinsulate. I had to try it, at least for the sake of research, right? Well, this particular quality of Thinsulate is not so thin. Definitely thicker than I expected. I was a bit stunned when I opened the package. Apparently it comes in different lofts, like quilt batting, but this one is thick, and I started to feel a little intimidated by it. But never fear; I soldiered on. I had already assembled the coat lining (it’s a Robert Kaufman print I purchased at Treadle Yard Goods in St. Paul, MN last spring), and because I was concerned about the bulk I constructed what equates to a second lining from the Thinsulate. I cut out the lining pieces from Thinsulate and sewed them together in the same way as the lining. After I sewed the lining to the facing I pinned the Thinsulate behind the lining and edgestitched it to the facing to hold it in place. It was sort of like sewing two linings to one coat, only one of them was about 80 times thicker than the other. When I hemmed the coat and the sleeves I folded the coat fabric over the Thinsulate so it wouldn’t get in the way of the lining. And that’s really the only thing I did differently in making it. But the happy (and rather surprising) news is that I sewed the entire coat on my little Janome Jem–not exactly a heavy-duty sewing machine, no matter what they say. So if you’re worried about sewing a thick coat on a not-so-heavy-duty machine, it’s totally do-able. The walking foot really made it possible. I highly recommend getting one if you don’t have and use it already. It’s great for thick fabrics as well as laminates (and, of course, quilts). I think this a really heavy-duty winter coat. It’s definitely keeping her warm, even now that it’s gotten pretty cold here. I was planning to make the removable quilting lining as well, but I’m afraid the bulk of the Thinsulate would make poor Tsia look like the Michelin Man, not to mention preventing her moving. And it appears that she’s going to be plenty warm without it, although I may still make it anyway. I’m wondering if the Thinsulate will live up to its name and actually flatten out a bit after some wearing. So there’s only one problem with the coat: my kid keeps growing, and I sort of forgot that she’s nearly 5 now. I made a size 4 and added an inch to the sleeves, to be let out next year. Now I’m nervous that she’s going to outgrow her coat before then! Can you see that mischievous gleam in her eye? She’s scheming to grow another three inches before next year, I can just feel it. P.S. Just before I posted this, I came across this article about adding a layer of insulation by interlining a garment. This isn’t how I did it (the seams still would have been too bulky, I think), but you might consider this method if you want to try adding lighter insulation to a coat or jacket. At Oliver + S, we frequently use the interlining technique when we’re making samples with really lightweight fabrics. A skirt made of Liberty Tana Lawn benefits greatly from an interlining of lightweight cotton. Just FYI. what a wonderful coat and great explanation of the method of lining. i just wish there was a reason for something that heavy here. Amazing, Liesl… I bet you really enjoyed watching S frolick in the leaves in this lovely coat you made. So darling! It looks like a great coat! I can relate to the fear of your child outgrowing things too quickly. It would be nice if they did their growth spurts at the end of the season, but before you've got next seasons clothes all sorted! Great tips about interlining/lining options too. Lovely, and she will be so snug this year! I bought a huge bolt of what turned out to be Thinsulate (I thought it was quilt batting) at an auction a few years ago and I still haven't used it all up. It's very thin. I actually do use it in quilts. The result is a Depression-thin quilt that's super warm. Great stuff. Love that fabulous coat! She looks absolutely darling! Thank you for the great tip on Thinsulate and the bookmark on adding interlining. Fantastic idea. Awesome Liesl, I love it! 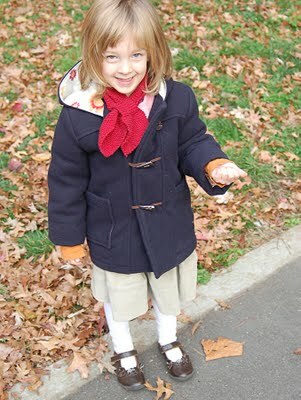 And I have to say that I knitted a scarf almost identical to the one your daughter is wearing! How great!? 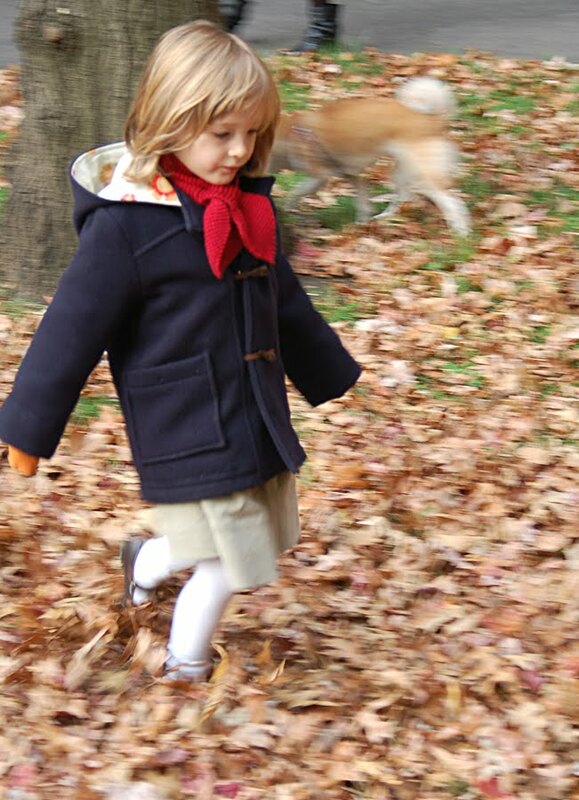 I made that tan coat – my daughter wears it EVERY DAY! and it's adorable on her. I didn't have any issues with the thinsulate at all – I simply trimmed it away (like a stacked seam) in areas that it would have created too much bulk. 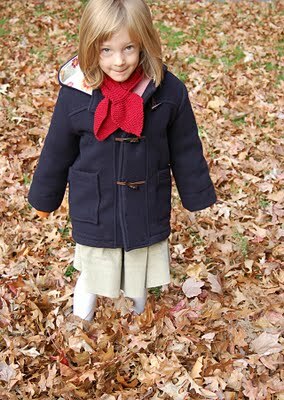 The coat is so cute, functional, warm. LOVE that little me inspired YOU! Great way to start a snowy morning. Thanks! I just ordered up a eight of your patterns today. Will have to wait until the 25th to open the box. This is the one I am most excited about. It is timeless. Thank you for all the great tips you give on the blog. I can tell you are a great teacher. 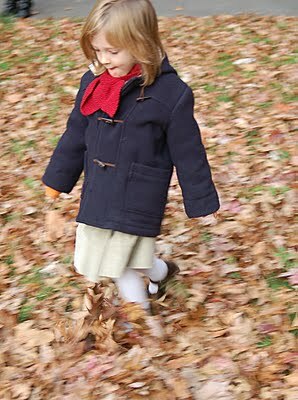 winter seaons is coming up and my daughter Amy has outgrown her coat, i might be getting one from you guys!